On Friday I participated in an experiment to remotely amplify a seminar by UKOLN’s Brian Kelly, in which he discussed: “What Can We Learn From Amplified Events?”. This talk was presented at the University of Girona, Spain. Brian’s talk was amplified in a number of ways. There was a live video stream (recording available here), his slides were available on both Slideshare and Authorstream, and he encouraged the use of the Twitter hash tag #udgamp10 as an online conversation space for both physical and remote participants. There were two people providing an official Twitter commentary directly from the venue (in Spanish and Catalan), whilst I was providing a commentary in English from my home in the UK via my @eventamplifier account. After the event, blog posts were published by Marieke Guy, Ann Priestley, Jordi Poater and Miquel Duran reacting to the talk, whilst Brian himself blogged to answer some of the questions from the remote audience that he was unable to address at the time. I want to pick up on some of the issues that Brian raised in later posts, but for now I want to analyse the experience of remotely live blogging the presentation and look at what we could learn from the experiment…. Brian and I have been discussing the ways in which a speaker can help a live blogger to prepare and therefore provide a more comprehensive commentary, so we used this opportunity of working together to explore what this might entail. Brian ensured that I knew the Twitter names of people he planned to refer to in his talk, and that I knew about anything unusual he intended to to (including asking the audience to tag any #eureka moments). He also provided me with all the links associated with his talk and emailed me before the event to let me know about any changes. In this instance, I was very familiar with much of the content that Brian intended to cover in his talk, so he did not need to recommend any background reading. I found this preparation very useful – although I still found that I needed a browser tab open to find resources and provide links or quote from them as quickly as possible. Brian had made the links available on Delicious, but I feel that links do need to appear in context within the commentary. Whilst having the links in advance did save me time and give me greater confidence that I was looking at the right resource, I still needed to be able to navigate these resources quickly to make proper use of them. I was also much more comfortable using Twitter names when Brian referred to specific individuals in his talk. At previous events, I often erred on the side of caution if I do not know the right Twitter name for an individual, so I simply refer to them by their surname as one would in any other form of report. Using the Twitter name gives the person involved virtual ear burn, which enables them to participate in the conversation and even contradict or elaborate on the point made. This means I was able to amplify the presentation more effectively, rather than just reporting on the content. The biggest issue I experienced was that of screen real estate. I have a 17 inch widescreen on my laptop, but I still struggled to fit the live streaming page, the slides, search screen and my Twitter client of choice (Hootsuite) on my screen at the same time at a size that I could practically use. When I initially logged into the live stream page, I was excited to find that I would tweet directly from that page and see other tagged tweets in the stream. Perfect. Except that on closer inspection, the interface only allowed tweets of 103 characters. When you are trying to provide a comprehensive commentary, sacrificing 27 (not including your event hash tag at 9 characters) is actually a big deal. I also needed to see any @replies to my account, and any direct messages from the organisers. Unfortunately, our bandwidth did not allow for me to have a second computer running the live video stream without slowing down the stream significantly, so I ended up listening to Brian rather than watching, whilst I flipped between tabs for the slides, Hootsuite and related links. 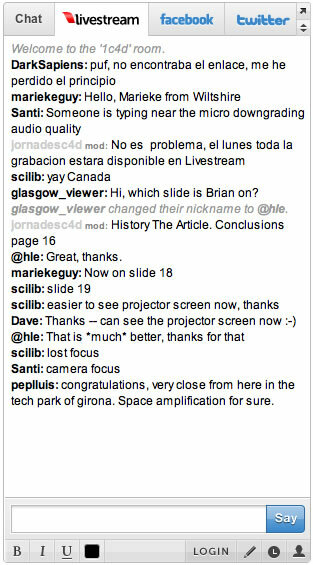 Interestingly, given my post about the use of radio to amplify events, I found that the vast majority of the time I did not need to see Brian via the video stream. I occasionally needed to flip to the video to check which slide he was on, as he skipped several, but throughout most of his talk I was able to just listen. On reflection, this mirrors more closely what I do when I am physically present at an event – I often do not look up at the speaker and just flip between tabs to find what I need. However, I do wonder if this dispersal of resources across different tabs or windows is a comfortable or convenient experience for a remote audience as they interact with the event? Does seeing the speaker help to engage their attention, in a way that I perhaps did not need engaging, given my role? Aside from stealing 27 characters from me, I was impressed with the Livestream interface, which provided multiple options for people to comment, including via Twitter, Facebook and their own chat box. This provided both choice and accessibility, which was great. However, it did mean that there were different conversations going on that were not interlinked – a common problem when you are trying to have an amplified conversation. The Livestream chat seemed to feature mostly technical comments (e.g. “Someone is typing near the micro downgrading audio”), whereas the bulk of the open discussion occurred on the Twitter hash tag. Posting a comment to Facebook does help to make more people aware of the event and its content, but it is a closed environment, so it is much more difficult to track and archive these comments. I suspect that we will be studying this aspect of the experiment in greater detail, but suffice to say that the mixture of languages in the Twitter search did ever so slightly affect the level of cross-pollination between me as the commentator and others discussing the presentation on the hash tag. I speak neither Spanish nor Catalan and was not using any type of auto translation service, so I was not able to pick up and re-use information (including links or potentially Twitter names) that were tweeted by others. This did not substantially affect me, as I already had the resources I needed and there were plenty of people tweeting in English. However, it reminded me how I often find it useful to keep an eye on what people are tweeting so that I can identify what interests the audience most and assess their level of understanding. Again, I need to explore this in more detail, but some of those tweeting locally (including the official Spanish and Catalan live bloggers) found that some of their tweets did not appear in the Twitter search for the event hash tag, so were effectively invisible from the conversation. There could be a number of reasons for this, and we need to research this further with the local organisers to see if there is any guidance that can be offered in the future to avoid this problem. The nature of the talk and the way it was planned meant that Brian and I were working much more collaboratively across time and space than the speaker and live blogger might do ordinarily. The result was that on a number of occasions Brian spoke to me directly, either asking me to elaborate on something, answer a question or complete a quote for him. Apart from being a bit spooky (except to my husband, who was the only person who could hear both sides of the conversation when I instinctively answered back verbally before replying via Twitter), this raised some interesting issues. Firstly, I was watching via the video stream, which occasionally stopped to buffer before continuing. This meant that I was slightly out of time with the live event, even before you add in the extra time it takes to type an answer and craft it into 140 characters, compared to the time it would take to speak, which is obviously the more flexible way to respond. Secondly, it meant that the talk is much more closely tied to its commentary, as anyone watching without access to the Twitter search would not be able to experience the talk in full across all of its dimensions. Ultimately, I although I was closely involved and enabled the presentation to take on multiple dimensions, I was not actually in the room. This meant I could not relay questions from the remote audience or answer their questions about the size of the physical audience – I had to leave that to the local organisers. I also could not directly answer Brian’s questions to me in a way that was accessible to the physical audience at the time. Were we to repeat the experiment, I would suggest connecting via Skype so that I could be brought into the room more directly – for the benefit of the physical audience and the remote audience. The technical challenge of enabling all remote participants to link in and ask their question verbally or via webcam might still be too troublesome, but having a real voice in the room to act as conduit would be beneficial. Overall, it was a successful experiment, which has generated lots of ideas for further routes of exploration. I would like to thank both Brian Kelly and Miquel Durran for involving me – and compliment Miquel on the operation of a great amplified event!